How to use Humor Effectively in Your Nonfiction Work - Write Nonfiction NOW! 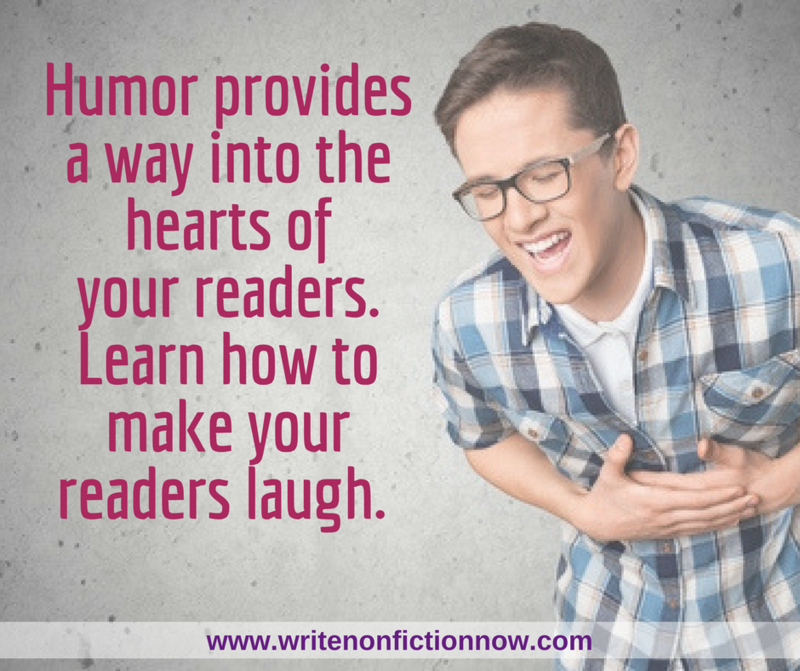 Do you use—or try to use—humor in your nonfiction writing? Writing humorous content isn’t as easy as it looks. In this guest post, book editor C.K. Bush (@theladyck) provides excellent tips on how to become a funny nonfiction writer. Humor is an important tool to have in your arsenal. It can help get readers’ attention, create a rapport between author and audience, or break up the monotony of a longer piece. There’s a catch, though. Writing with humor is much harder than it may seem. It’s all too easy to make jokes that fall flat, don’t work as well in writing as they may work out loud, or that make your readers cringe. In my work as a nonfiction editor, I’ve come across a number of authors who struggle to include humor in their writing. In this post, I’ll share the most common humor pitfalls I’ve encountered and how to remedy them. Pitfall #1: Trying too hard. This is the most common issue I encounter with authors whose use of humor doesn’t work. They may include too many jokes, pepper their writing with asides and parentheticals, or make deprecating self-referential comments at every turn. You might notice one common denominator here: too many. The writer’s concern with making the book funny, in these cases, manifests itself as a nervous overflow of jokes. In these cases, I tell the writer to take a step back and cut down on many or most of these attempts. When it comes to humor, less is more. Writing with humor is much harder than it may seem. As you become a more seasoned professional, with more experience and authority to convey in your writing, you also become something else: older. Many writers who hope to use humor to connect with a younger, hipper audience, instead end up sounding hokey. Emojis, memes, and current TV references will sound forced if they don’t come to you naturally because you think they are funny. Remember: The relevant younger audience will be drawn to your work because they are looking for a clear take from an wise person in the field—not because it sounds like something their friends would say. To you or the experts in your field, a particular pun might be especially hilarious. But someone coming to your book for information about a topic they don’t already understand might not share the same opinion. Here’s a good rule of thumb: If a joke requires a lot of set up for someone who has less background in the subject than you do, cut the joke. You shouldn’t need to do a lot of work to explain why something is funny. You shouldn’t need to do a lot of work to explain why something is funny. Pitfall #4: Humor just isn’t your thing. If you’ve tried cutting back on excessive jokes, only including humor you actually find to be funny, or eliminating jokes you need to do a lot of work explaining or setting up, and your editor or trusted reader still doesn’t find that the humor’s working, there’s something you might need to accept: Humor might not be your thing. Don’t worry—this doesn’t mean your work is destined to be dry or unreadable. It just means that other techniques, like pathos, inspiration, or suspense, might be more in your wheelhouse. Humor can be a difficult tool to incorporate into your writing, and, more often than not, deliberate attempts to be funny fall flat. I find that writers often elicit the most chuckles from me when they casually write things using a subtle wit, one that comes naturally from their own voice or experience. The best humor is not written on purpose but on the way to other writing.